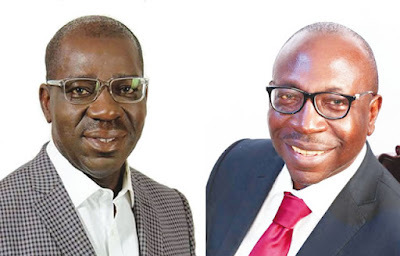 The Peoples Democratic Party on Monday said that it would challenge the outcome of the Edo State governorship election at the election petitions tribunal. The Independent National Electoral Commission had last Thursday declared the candidate of the All Progressives Congress, Godwin Obaseki, as the winner of the election. According to the electoral umpire, Obaseki had a total of 319,483 votes while his counterpart in the PDP, Pastor Osagie Ize-Iyamu, polled 253,173 votes to come second. The opposition had rejected the result, which it described as a fraud, and accused INEC of alleged complicity. But the Edo State PDP Chairman, Chief Dan Orbih, who disclosed this in a chat with The PUNCH in Benin, the Edo State capital, explained that the party would leave nothing to chance to prove that the result was manipulated and that it would also expose the alleged corruption and incompetence of the electoral commission. He, therefore, called for the dissolution of the present leadership of the INEC. Orbih said, “Of course, we are going to file our petition at the election petitions tribunal. We will give it our all. If nothing else, to expose to Nigerians how corrupt and incompetent INEC is, under its present leadership. While stressing the role of the judiciary in upholding the tenet of democracy, he expressed confidence in its ability to give justice to Nigerians. “We will pursue this matter to a logical conclusion and I believe that the judiciary has a role to play to save democracy and give Nigerians hope that, in a country where people do things with impunity, people can still approach the judiciary for justice,” he added. On whether the party was convinced that the outcome of the tribunal would not end in favour of the candidate returned elected by the INEC, as was the case in Bayelsa and Kogi states, Orbih noted that the PDP would give the tribunal the benefit of the doubt. He said, “What happened in Kogi is not what has happened in Edo. What happened in Bayelsa is not what has happened in Edo.